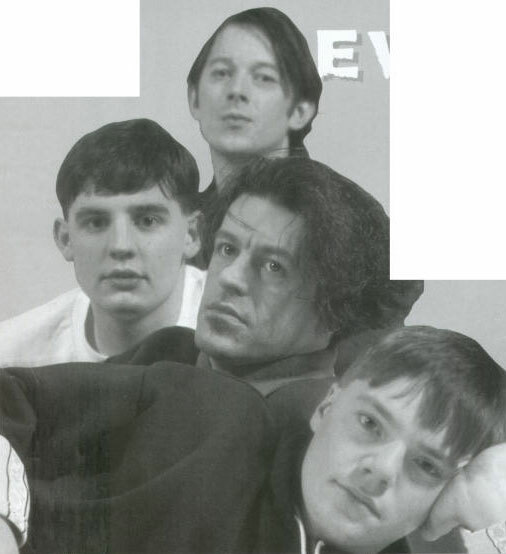 Twelve months ago Mancunian house quartet 808 State signed to ZTT Records and before the ink had had time to dry their debut release, Pacific State was flying up the charts, destined for Top Ten status. An album, 90 was soon to follow, though losing its way to the top in the competitive Xmas onslaught it fell sadly short of its expectations. In the following March The Extended Pleasures Of Dance E.P. was issued, securing further critical acclaim. Next on the agenda was a fruitful collaboration with fellow Mancunian M.C. Tunes resulting in the hits The Only Rhyme That Bites and Tunes Splits The Atom. Back as a separate unit 808 State have just notched up another top ten hit with Cubik/Olympic and are justifiably feeling very much on top of things again. Presently beavering away on writing and recording new material in a studio in the wilds of Cheshire, Rave travelled northwards for a lesson of olympic proportions. Arriving at the studio about mid-afternoon I found DJ Darren scouring through a bunch of 12''s, possibly for inspiration. Looking up, he extended a hand and resumed his search. I made my way about the studio stumbling upon programmer/engineer, Graham Massey. Soon I was to be in the presence of all four members, having been introduced to DJ Andy and Martin Price. So, what's behind the unorthodox title of your new single? "You gotta have 'em," claims Graham. ''Because Love Me Baby has been hammered,'' offers Darren. "There are enough bands these days using obvious titles,'' Graham continues, ''And we don't use them for that reason. Besides, you've got to keep some sort of originality." The guys seemed bemused by my interest in their choice of titles, so having obviously exhausted that line of enquiry I steered the conversation around to the topic of their new material. "We've got this sort of inner con-science which the four of us possess that won't allow us to do what you'd expect, '' Martin explains. ''It's not like we're being tripped or anything, it's just what we found happens. If we went in to make a certain kind of record it would turn out completely different." In that case, what ideas do you go into the studio with? ''What we do go in with is, like, what we don't want to do; for example we don't want to make dance records like what are happening at the moment. They all sound the same because they are in a certain kind of vein and obviously we don't want to do records like that, there is no point,'' insists Graham. "What we look for is a space of our own to move into." Not ones for good old fashioned convention, 808 State, just like Sinatra before them, preferred to do things their way. ''It's not like we're against any market as such. We wouldn't put ourselves out of the market by being overtly uncommercial on purpose. That would be foolish," states Martin. But doesn't this blatant detour from the norm restrict their chances? Apparently not, judging by their cur-rent achievements. ''For me personally the exciting thing about getting in the charts is being in there amongst quite progressive music,'' Graham comments. ''With your Kylie's and Jason's it's refreshing to see something like Cubik alongside them. It adds a bit of an edge to it all," "The other night it was great to just hear it on TOTP because it's so different to anything else that's in the charts," says Martin, receiving support from the other band members. With the advent of M.C. Tunes to the scene and their obvious commitment to his career it could have been considered quite foolish to abort their own work to assist him. ''When we were doing Tunes' album we didn't realise that we were in actual fact neglecting 808 State," Darren recalls. "We put a lot of good ideas into his album and a lot of time. We did manage to do some dates in the summer though but for the most part we've been in the studio recording." "We did a good job," Martin adds. "I mean, a lot of people said that it wasn't the best thing for us to do at the time but in the long run it eventually was. After the success of Pacific State we were being put under pressure to come up with something similar, which we didn't want to do, we didn't want another saxophone track. It was just one of those things in that we tried it and it worked and we were dead chuffed with the result. After Pacific, I think if we had gone into the studio and beavered away for the second single thinking it has got to be like this or that then I'm sure we would've messed up." "Actually, The Only Rhyme That Bites was to be our second single until Tunes came to us," Darren interrupts. "He came to us, we didn't go to him." I asked exactly how the working relationship came about. "We go way back from when we first started out as a collection of hip hop groups and Tunes was involved with A Guy Called Gerald," remembers Graham. "We made an EP of those various groups and he dates back then. That was our first association with him. "I went to school with the lad," Darren continues. "I knew him then and he used to rap all over the show, everywhere. All he wanted to be was a star." 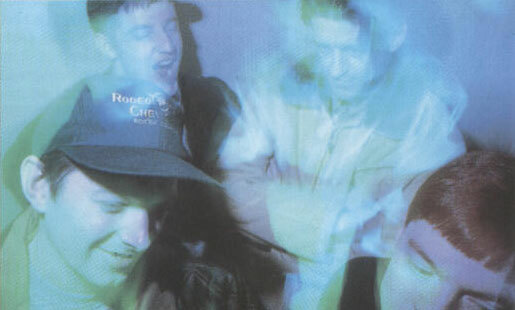 808 State are full of praise and admiration for Tunes, admitting that they took him under their wing to give him a peg up, and in working on his debut they found the experience highly beneficial. "808 State is obviously not a rap act and working with Tunes gave us the opportunity to understand that sort of culture more. It taught us a lot of do's and don'ts," confesses Darren. "It's a group thing for us that we have to move on and try all these different things," states Martin. "There's no point in having just one attitude, you're learning all the time, you never stop learning and you have got to use different stuff and work with different people to gain the experience." Absolutely adamant about not letting me hear their new songs, they had this to say about the forthcoming album format. "It's definitely going to be a double 12" package, 25,000 limited edition," says Martin. Darren sheds light on the reasoning behind such a package. "It's going to be on 12" for the DJ's in the clubs. DJ's don't play albums, they're lazy," so speaks a DJ. "Our music is played in clubs so with a double 12" one can be for his hi-fi and the other he can put in his box to take to the club and play." "It's gonna be about having the tracks bigger and having more room for the needle," explains Graham. 'That way there will be better sound transition from needle to p.a. speaker." The 808 crew feel strongly about the stifled party scene both in Manchester and nationwide. "I think more people should be working with the local councils to put things on in localised areas," suggests Martin. 'There should be more effort to get these raves or whatever to happen without them having to be under-ground." What kind of parties are you guys into? "We're into dancehall. We recently had a party for Darren's 21st Birthday and it was really good. It was like back to the old style again, a dirty old place and you shuffle about in the cold but it's yours, you put it on and you feel something for it." Darren recalls the bands trip to the States earlier this year. "We played the Sound Factory in New York. It was like a cracking place and we were on the bill with Northside and The Mondays. It was a good feeling to be there. It wasn't a nightclub and then again it wasn't a warehouse, it was the in between and that's what we need over here." By all accounts the Manchester policing is a little zealous in its efforts to keep things orderly. "You can't put a wedding on in Manchester without being busted," Darren explains. "The police would be there knocking on the door asking you to turn that Carl Douglas tune off. So what do you do?" 'The police came to Darren's birthday party and they didn't really know what to do or how to take it. They didn't seem to know how they were sup-posed to react," comments Martin. So it would appear that Manchester isn't all it's cracked up to be but then I guess nothing in life ever is. However, I think it's a safe bet that there will be some corking parties in celebration of 808's new found success in due course.